I posted some time ago about our chow attacking our collie. She has been on prozak for 2 months now and is much more mellow. She and our collie have been going to obedience classes together and are doing well. What I'm wondering about is decipline for aggression. Our trainer uses positive reinforcement for training, but believes in pinning a dog (on its side, not its back) if it starts a fight with another dog. She has 5 malimutes that are house dogs along with several others that are used for pulling sleds. She has had success with pinning her dogs if they start to fight. Her thinking is that they have to be tethered together while "mushing" and have to get along. Our behaviorlist on the other hand has a completely different opinon on this. She thinks time outs are the way to go (Bear doesn't mind time outs). Bear and Benny really haven't had any fights in the last 6 weeks, but the only time they are together is at class or in the back yard. I'm wondering what everyone thinks about pinning, have you used it and did it work for your dog? Do you think it will cause more problems than good? I know there is at least one dog trainer that is a member here and I'd really appreciate your opinions/suggestions. A chow and a malamute share a double coat, but nothing else, especially personality. 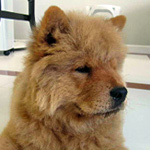 Chows do not take well to alpha rolls, (which is what pinning is, whether on the back or on the side it's an alpha roll) Alpha rolls will make your chow hand shy which means that she'll start to withdraw from you, anticipating that you will roll her. Eventually if you continue with it, she will begin to snap and everntuatlly bite, she'll also react to anyone who tries to touch her the same way. If she doesn't mind time outs, then there is something wrong. She hasn't bonded with you, of course with the prozac in her system, she can't. Using drugs to force correct behavior on a dog is just wrong, their behavior can't be trusted. Get her off the drugs, WORK with her, form a bond, once you have that, then she will mind time outs and recoginize them as something she doesn't to endure. You might need to work with just her sometimes. Pinning a dog on its side can end in a dog attacking and later euthanasia. If you think you are quicker and can handle the strength and keep your dog down then you can do that. But use that as a last resort. I dont agree you pin your dog after he attack another dog. He is winning the fight and here you are! No. You could verbally reprimand him and be done with it and attend to the loser if wounded. If not , I would just verbally reprimand. Besides they know how to stop if the losing dog shows its belly. The problem will not stop if you have both dogs with the tenacity of a terrier. Why is your dog on prozac? With training: think of it this way, your dog also has its own personality and does not fall into generic dog training. All dogs are unique. But they can be motivated by foods. You'd do well concentrating on giving rewards to positive attitudes. Food of extra positive behavior. Our behaviorilst put Bear on the Prozac. Bear was overly sensitive to any kind of stimulus and she would look for something to attack, which was usually Benny. Even when things were calm she would sometimes just walk up to him and attack. He gives her submissive signals but she doesn't read them. We have been working on desensitizing her to him along with obedience training. She is much calmer now and along with the training we can have them out in the back yard together and we also can have them together in the house (we have a leash on Bear just incase...). We just make sure they are separated during times of excitement...someone coming home, the UPS guy etc. We haven't had any fights lately but we don't have them together when there could be. Our trainer wanted us to work with them using high excitement situations and to pin Bear if she tried to go after Benny. That is why I was looking for imput about pinning. Many female chows are hyper. If you read through many of the posts on here you will find that over half the chows with crazy, hyper behaviors are the females. Many have earned the title HRH, (Her Royal Highness) because of their attitudes. The notion that chows are either overly aggressive or laid back and calm seems to be fueling your behavorists recommendations. How do I know this? I have one. Firesong is hyper, everything sets her off, she was also badly socialized as a young dog, (I rescued her at 1 year old) Everything set her off, a bag blowing in the wind, something new added to the environment, or removed from the environment, skateboarders, bicyclist, other dogs, babies in strollers, trashcans moved, new cars in the neighborhood, squirels, rabbits, birds, you name it and she reacted to it, usually by showing some aggression outside, I would laugh at her and then Darkwind and I would go nearer whatever it was this helped desentitize her to things outside. I also found that training her to do certain tricks outside helped expend some of that energy, jumping on a wall or walkway on command, sitting, jumping down etc. 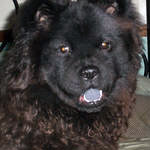 Many of the female chows make good agility dogs, try teaching her to fetch, do simple agility etc. Inside she'd go after my bigger chow Darkwind. Darkwind was twice her size and normally put up with her nonsense just submitting to it, but if she went too far he'd fight back and put her in her place, but I learned to step in before that and stopped her before she went too far and put her in a time out. When Darkwind passed away and I got Dreamdancer, he was only 8 weeks old so I stepped in even more diglently. Now she is 12 and he almost 7, she still gets hyper and wound up, and if she's too excited she will turn on him, he's learned to start a chase game and wrestle tussel with her, and that normally calms her down and works out some of the energy. If she goes too far though I step in with a sharp "hey" and she backs off, if she fails to do so a time out is still required. Right at this very moment she is walking around huffing, and sort of growling because the upstairs neighbor's kid is teasing the other upstair's neighbor's dog who is barking. I just told her to settle down and while she stayed up standing for a moment she did quiet down. I agree with Victory on this one, even with limited experience with female chows. Our 4 month old female is without fear. Absolutely no problem going into corners to retrieve something when she knows she cant turn around and will have to back out. She chases our male at every opportunity. He plays well with her, but i see this as a set up for future days. He is 18 months and about 55 lbs. At 4 months, she has already topped 30. She is stubborn. Teaching her to 'leave it' has been a chore. Every other command was an absolute breeze. She has decided the only thing more interesting than my shoe (while still on my foot) is her ball. That has resulted in her learning that if she attacks my foot, we will play ball. Interesting though, is that she will quite easily expose her belly to both us and the other dog. My male will resist that position. Rory (the male) is well trained and socialized, but i know if he were to be pinned, it would be a bad result. He would either hurt himself trying to get up, or bite. I suspect my girl wouldnt even try to wrestle loose, she would just lash out teeth flying. Pinning a dog, in my opinion, is outside the scope of asserting your position. It places the dog in a position of defeat and works more toward breaking the dogs spirit than it does teaching proper behavior. Rory is on an AKC campaign, and Amber will soon follow. Much of that is for socialization. They will walk through crowded rooms of both people and dogs. They will not react to behavior around them. They can bypass a crated dog that is barking, growling, etc and pay it no mind. They will encounter children with less than appropriate meeting manners and sit, lay, and stay without complaint (OK Rory is at that point, Amber is going to be a work in progress). Amber, as part of her socialization has been spending time with a CGC certified Anatolian Shepherd (wow is that a big dog). Amber did a nice job mimicking her calmness. Personally, i would object to medicating a dog for behavior. All good advice, so far. Your trainer is a nut bar and just making your chow worse. 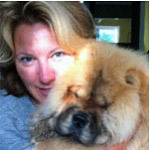 Calm, patient, persistent control and your chow(s) will do anything and everything. Fights between those critters living together is as normal as people fighting. You indifference and calmness are what will de-escalate the violence. I have an excitable male, and currently a excitable female pup along side him. He will put her in her place, but not intentionally hurt her. Scarfing her near to death at times, but never beyond that. His sister who has passed was the calmest chow anyone, vet or person had ever seen except when she let the T-Rex out of the teddy bear. The only aggression is what you bring to the room/vicinity and chows feed off energy like few other species.